Most of our own fruit harvests are in now (just pears remaining), and I was glad to take a breather today. (Tomorrow, I'll check my normal road-side apple trees, and may be buried in fruit again). The weather seems to be cooling off awfully quickly. I'm not sure whether to think it's just a cool spell, or if this is a really early fall coming on. Is it unusually cool where you live too? #1-2 worn yesterday. I think I need to retire these jeans - they're giving me a muffin top. #3-4 with new-to-me black knee-high boots (worn to work in the arctic A/C). I think these boots will do nicely come fall/winter. They're a tad big - so I can add an insole. #5 worn around the house today to clean and organize. Wish I'd gotten more done! I know your tired of Spiegel PSA posts - so am I. But I thought it worth mentioning that the whole site is 60% off right now. And that lemming leather jacket is currently $11.60. Yeah. I'm not even going to wish I'd waited. There's only a few sizes left, and they won't be long at that price, I don't think. #2 - 3: worn out on a date - the shoes are uncomfortable, but I'm going to try lacing them differently to see if they can be rescued. #4: I liked this one - I love the fit and drape of the shirt, and I think the blush color is okay on me - so I'm keeping it for now. The pants are on the "mend" pile to taper the legs - I think that will make them more wearable. Bonus pics #6-7 - the concord grapes are ripe. Picked about ten gallons yesterday. That will make a lot of jam - I may have to try wine or juice or something, just to use them all. I'd love feedback and suggestions for my outfits! #1 Worn to church on Sunday - the top is brighter than it shows in the pic - has little bits of white, citron, black, cobalt and raspberry. Worn with cobalt clams and raspberry earrings. I liked it. #2 Worn to can peaches today. This top doesn't fit properly and will get donated once it's washed. I'd love feedback on what works and doesn't work so that I can continue to improve! Sorry for my absence through much of the week. My hard drive died, and I'm buried in processing our produce (gratuitous pics after the WIWs). But I did manage to remember to snap WIWs a few times. #1 Teal tee and black dressy shorts. I took this pic while waiting for my fuschia toe nail polish. I added my black strappy dansko sandals. #2 Black drapey tee with striped skirt - Angie's MOTG formula with the striped skirt, except mine's not bodycon. 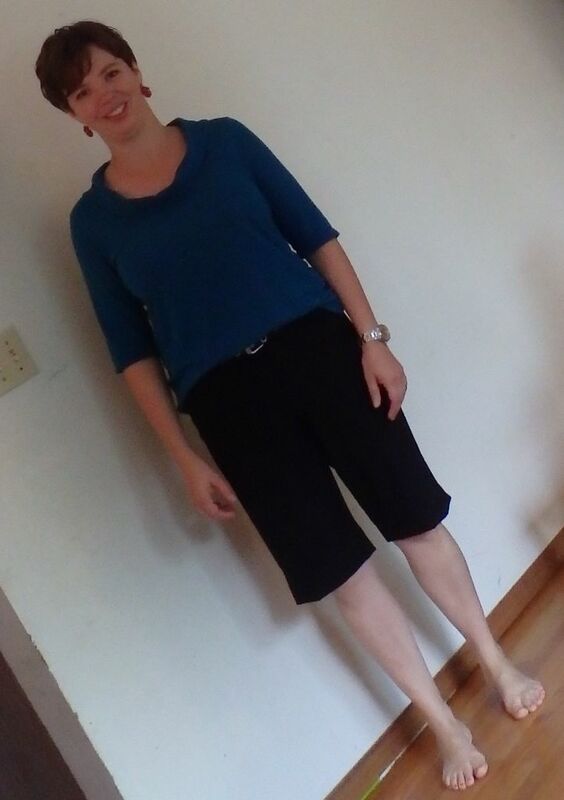 #3 Cobalt shorts from JulieinMI - Thank you so much! Love the fit and the color! with my checked aqua shirt. #4 jean clams, gray top with brown belt and Keens. I liked this combo - I'm not sure why (I liked it much more with brown belt and shoes than black) and wore it two days. Now that I see the pic, I think I should roll these shorts up to above my knee. #5 Similar to #4, but with a coral button-down underneath. To me, this didn't quite work. But I can't put my finger on why. Maybe the necklines are competing? What do you think? What works and doesn't work? #6 First year for our green grapes to bear. #7 My husband (and his mother and a few kids) uncapping honey so that we can extract it. We got about 60 lbs of honey. #8 The bucket of peaches that I'm currently working my way through (also about 60 lbs - it's a bit over half of the peach harvest this year). #9 Just because it's so cute - my daughter and niece in a geodesic dome that we built out of newspaper together. My Spiegel jacket arrived today. And I need your opinion. I ordered a 10. If I'd actually read the sizing guidelines on their site, I probably would have ordered a 12. (And I suspect I could have easily gone up to a 14). So I'm kicking myself. I had hyped it up in my mind as gloriously drapey. And the size I got is NOT drapey on me. In fact, when it's snapped, it's way too tight. I'm sorely disappointed (probably enhanced by other disappointments - my hard drive died, I'm tired from a super busy week, etc...) The one redeeming factor is that I'd wear it open anyway - so maybe it's not a big deal that it's too tight when it's snapped. It's currently worn over a light tee shirt. I'd like it to fit over a sweater, but didn't try it on with one yet. I suspect it'd be snug. What do you think? Should I try to exchange it? (Or sell this one and buy a bigger size? Current price is a bit over $50) Since it's leather, should I just let it stretch out a bit? As a side note, their email said that they shipped UPS. The tracking code they provided was FedEx, and USPS actually delivered it. Go figure. I loved Angie's outfit today, so I picked up my closest pieces to copycat it. It doesn't work nearly as well as hers, but I liked it anyway. (#1). 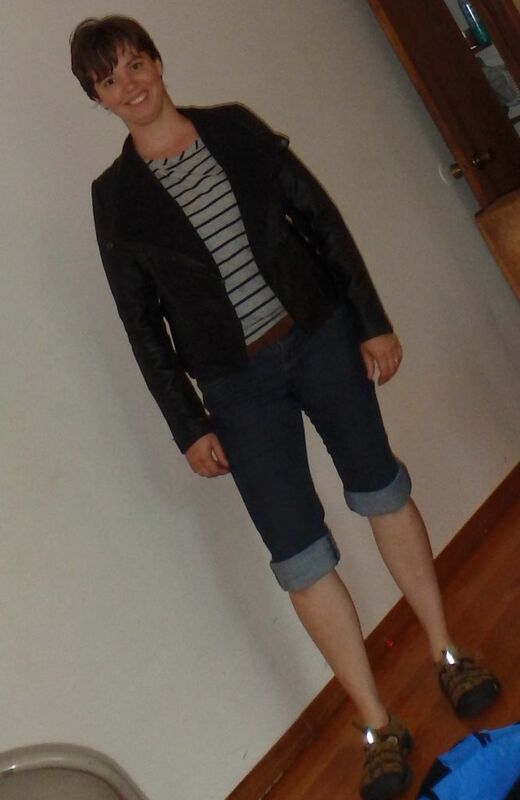 I tried it with lighter oxfords, (#6), but thought these espadrilles worked better. Yesterday I copycatted a pin that I can't re-find. 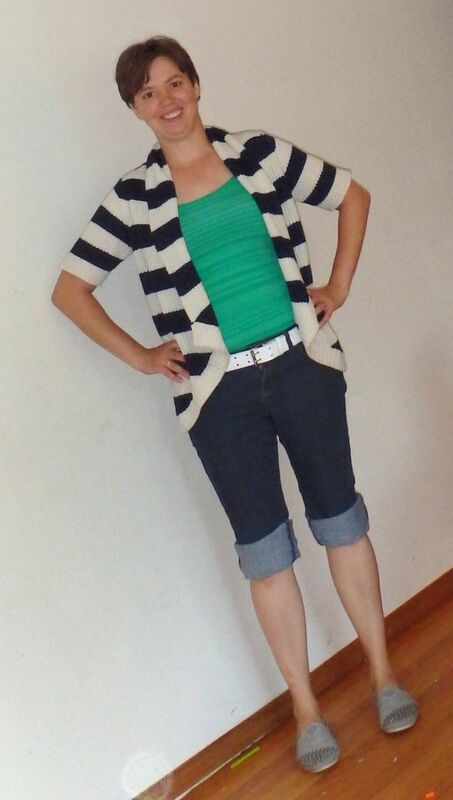 The pin was military-inspired green clamdiggers, with a black tank top, a studded belt and neutral shoes. I tried two versions (#3 and #4), but wore #4 out because it was warm outside and that top didn't require an undershirt (There's a black and silver belt under there, really). But I like the looks of #3 better. Bonus pic of my first attempt at making mozzarella cheese. It worked!